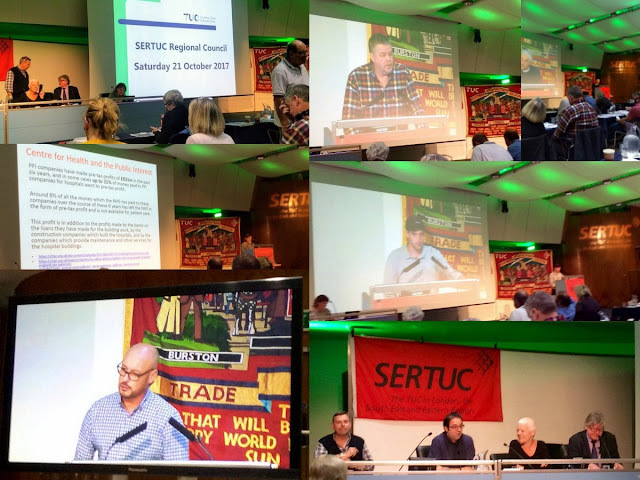 On Saturday I went to Congress House for a meeting of the South Eastern Trade Union Council (SERTUC) as an UNISON delegate. I haven't been a delegate to this body for some years and was pleased to be there again but sad to note that this was the last meeting for Megan Dobney who is retiring as SERTUC Regional Secretary. While relatively few people actually enthuse about giving up their Saturday mornings to attend trade union meetings, I have usually (not always) enjoyed SERTUC meetings in the past. This meeting was very good and well worth attending. The notoriously shy and retiring Chair, Tony Lennon, kept the meeting well in order and moved business on. Following a video made by UNISON Police Service Group, UNISON delegate, Mark Task, spoke eloquently about the cuts in Policing budget and how in particular we must defeat the recent proposal to get rid of all PCSO officers in Norfolk or else this will happen next everywhere. There was a marvellous presentation on the complete and utter PFI rip off, by Helen Mercer and what a future Labour Government should do about it (nationalise the debt). An inspiring presentation by a young McDonald's worker who had helped organise their first ever strike in the UK last month against poverty pay and bullying. A very brave and inspirational young man, who gives us all not only hope for the future trade union movement but also a kick in the pants that we must organise young people and not just right write them off as being in the "too difficult" box. Well done to the Bakers Union for taking such a lead. The CWU spoke about their dispute with Royal Mail and that despite the legal action taken against them to suspend strike action, they are confident that unless mediation works, then there will be massive and subtained strike action. We were all interested in how they won a 89% Yes vote with a 74% turnout. Fantastic result. My former Tower Hamlets trade union colleague, Alex Kenny, from the NEU encouraged delegates to support the lobby at Westminster on 24 October against School Cuts. Dr Francisco Dominguez from Venezuela Solidarity Campaign gave an update on the terrible attacks they face and how we support the legitimate government against Trump attacks. The new Regional Secretary, Sam Gurney, (must check with him if there is a Newham Gurney connection?) spoke and thanked Megan for all her work and that she is "Going to be a very tough act to follow! ".